Four weeks ago we launched TAGAP 3, so let's celebrate with something, umm, special? What you see here is Penguin Poop. Yes. Penguin... poop. It's not real poop, mind you, but rather a bag of creatively named candy. The great penguin-spotter Cher Johnson sent these our way from U.S. a while ago, but I kept onto them. Because I had an idea. Remember the TAGAP 2 voice recording session? The TAGAP pill munching sounds were recorded via us penguin actors munching on candy. However, the candy we used in the session were almost sickeningly sweet, to the point that I swore we would never use candy for this again. 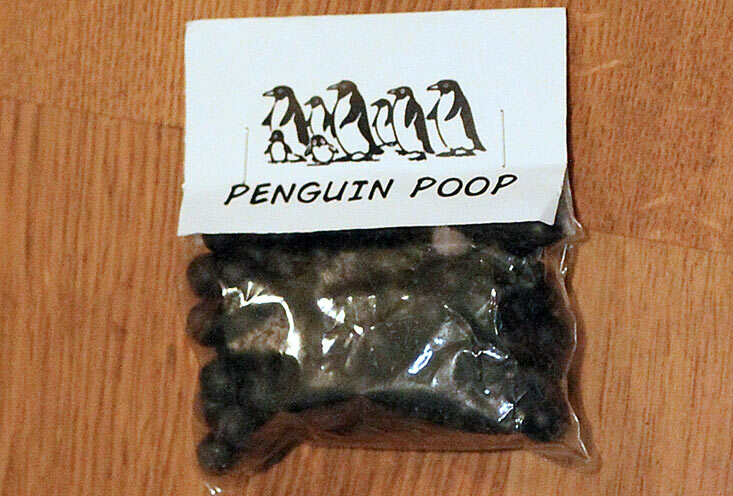 But with Penguin Poop in my possession, I changed my mind. Because of course we would record TAGAP 3's pill munching while chewing on Penguin Poop! And it worked great, as not only were these much better tasting, but they were also crunchy. It sounded much closer to chewing on pills. So, there you have it. The real TAGAP pills are Penguin Poop. You know, the stuff NASA tracks from space. Speaking of TAGAP 3 celebratory stuff, to mark it's first month out in the wild, on Thursday December 14th we will be launching TAGAP 3 v1.3 – with more fixes, tweaks and expanded scripting support for custom localisations.